The Reformation, Old Testament and A.D. I still remember the day in Church History class several years ago at Princeton Theological Seminary when our professor made the point that the word “Reformation” is not a harmless, neutral term to describe those historic episodes of the Sixteenth century. He went on to point out that some Roman Catholic scholars and historians, in fact, decline to use the word, and refer instead to the “Protestant Revolution,” or the “Protestant Revolt,” when speaking of those historic events. The latter terms, obviously, convey a far different assessment of the meaning and significance of what happened in the Sixteenth Century. 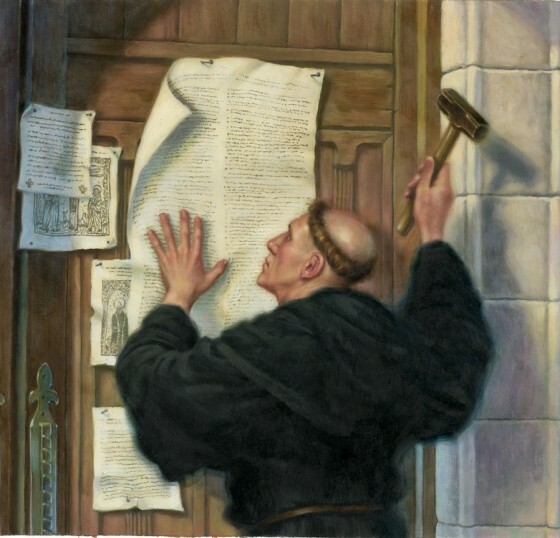 The term “Reformation” after all, implies that the Roman Church of the time was indeed deeply corrupt and in need of reformation, and that the movement led by Luther, Calvin, and others was a good thing that had predominantly positive effects. Roman Catholics who do not share those judgments may understandably prefer a different word. I have no problems with Roman Catholics who may prefer a different word here. However, I would hardly agree that I should not refer to those epic events as the Reformation and celebrate them as important episodes in the history of the Church, even if there are aspects of the Reformation that are regrettable. I would strongly object if my Roman Catholic friends tried to insist that I should not use the word, and should call it something more sympathetic to their views, such as the Protestant Revolt, or even something more “neutral” such as the Protestant Secession. I completely understand why my Jewish friends may not want to call the first 39 books of my Bible the Old Testament. After all, the term implies there is a New Testament, a new revelation that is not only God’s final word of salvation, but also a revelation that is definitive for understanding the true meaning of the Old Testament. As Paul put it, we have “the light of the knowledge of the glory of God in the face of Jesus Christ” (2 Cor 4:6). This has large and dramatic implications for understanding the Old Testament. Paul made the point rather graphically by saying that for Jewish readers who do not believe the gospel, there is a veil over their minds like the one that Moses put over his face after talking with God. “Indeed, to this very day, when they hear the reading of the old covenant, that same veil is still there since only in Christ is it set aside” (2 Cor 3:14). To reject Christ is to be blind to the true meaning of the Old Testament. This is a strong claim, but nothing less than gospel truth if Jesus is the Christ, the Promised Messiah. To deliberately decline to use the term “Old Testament” in favor of “Hebrew Bible” is to undermine the claims of Paul, and to suggest that the “Hebrew Bible” stands on its own as a sufficient revelation, without Christ. Again, I can understand why my Jewish friends prefer, indeed insist, themselves, on using other terms for their Scriptures instead of “Old Testament.” What I cannot understand is why so many Christians go along and follow suit. To do so is tacitly to accept the claim that the New Testament is not essential to understand the revelation given to Moses and the prophets. It is to back away from the claim that Jesus is the final, definitive revelation of God, without which the Old Testament cannot really be understood. I would argue for similar reasons that Christians should continue to use the traditional B.C and A.D. designations for dates instead of the currently fashionable alternatives B.C.E and C.E. Those traditional designations underline the Christian conviction that the coming of Jesus was of monumental importance, of such incomparable significance that our very calendar should mark the event as the center point of history. Again, I can understand why my Jewish and atheistic friends may not want to use the letters A.D, “in the year of our Lord.” After all, they do not believe Jesus is Lord, they do not believe that his life, death and resurrection are the single most important events upon which all of history turns. They do not believe that he is seated at the right hand of the Father, and that he will come again to judge the living and the dead, and that our response to him will define our eternal destiny. But what I do not understand is Christians who claim to believe those things, and yet surrender that designation so easily. Make no mistake. The term “Old Testament” and the designation “A.D.” are loaded with theological significance and far reaching implications. That is precisely why many decline to use those terms and pressure others to do so as well. It is thoughtless and shortsighted, if not simply feckless accommodation to the contemporary academy and secular culture for Christians to concede those terms on the grounds that they are trivial matters, not worthy of being made an issue. “Hebrew Bible” and “C.E.” are not neutral terms. Those who consciously prefer them and pressure others to use them as well understand this. Christians need to understand this too. They are taking sides on vitally important issues in the terms they choose. And there is far more at stake than a nickel. « Hebrew: the EASY language? At the risk of controversy I would contend that these changes are largely politically correct. My best man was Jewish and he was not overly concerned with political correctness but this is the climate we live in today. From the left we get this tinkering which threatens the very premises that make a religion what it is. I am very aware of some of the stories can be offensive but we are not talking about deconstructing the very nature of what is being taught but that certain antiquates practices are now not taken literally. Great post, Jerry. I agree. I had to read this quickly so I may have missed something. I think I would argue that when Paul talks about the “old testament/covenant” in 2 Corinthians he was not talking about a collection of books we know today as the OT. The typical Jewish way of talking about the collection at that time was the law, the writings and the prophets or the law, the prophets, and the psalms. Something like that. Paul had in mind the former covenant understood in relational terms with Israel at Sinai. That is why the statement about Moses’ veil is so appropriate from Paul’s point of view. Thanks David, a helpful qualification. As a practising Catholic Christian, I was a little shocked, to say the least, that there is a day remembered by protestants called ‘Reformation Day’. The Catholic Church was not /has never been ‘reformed’ by the protesters Luther, Calvin, et al. or in the years post Luther, Calvin et al. The Universal Church admits to past and present failures and to having sinners in her midst and yet, despite the corruption of years gone by to the present day, she has endured for 2000 years, carrying the message of Salvation through Christ Our Lord and Saviour to the ends of the earth. I think my reaction as a Catholic Christian is perhaps similar in kind to the gut reaction of those who baulked a the term ‘reformation’. There simply was no reformation of the Catholic Church. What the protestants achieved as I see it, is the development and physical establishments housing thousands of splinter Christian groups from which to pick and choose. Each one of them offering a different flavour Christianity. I might add, that the Catholics who refused to use the word reformation, were probably devastated at the choice the protestants made to leave the Church. The Catholic Church has and always will lead pointing Eastward, without veering from the Truth on the whim of someone who decides to develop a different interpretation of Christianity. Bravissimo Geraldissimo! The Mosaic covenant is not only “old” but now entirely passed away (Hebrews 8:13). Willingness to deny central Christian truth in favour of oversensitivity to the suffering of dead people at Auschwitz of 70 years ago is evil. The only time I use “Hebrew Bible” is when I focus on the Hebrew language as opposed to the Greek of the Septuagint Old Testament. And the foolish belief that peace will come from abandoning our “BC” and “AD” statements re Jesus as “C” Christ and “D” Lord are similarly wicked. religiously imperialistic Rabbinists and antitheists will not be appeased by capitulation on our cultural presentation of the messianic office of Jesus. Thank you for this, Dr. Walls. I feel, particularly as I work on more in-depth research in graduate school, so much pressure to use the “up-dated” language of B.C.E. and C.E. May we Christians always remember that this is indeed, AD.